Discontinued Sorry, View our other Camping Cots. This listing is for 2 cots. The Tracker Extreme Cot w/ Cargo Pocket, oversized at 85" long x 40" wide, is just as rugged as it is oversized, touting a 600 plus weight capacity with patented steel leg construction. Hassle free setup is quick and easy. A carry bag is included for convenient storage - folding down to 42" x 12" x 7". 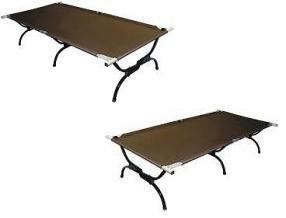 Use the Tracker Extreme Cot for camping, hunting, indoor use and more. In short, indoor comfort...outdoors. Dimensions: 45" x 15" x 13"